Former Lindenwood lacrosse player Michael Proskey keeps up with Ohio Valley University's Kobie Jordan during a game last season on March 4, 2017, at the Hyland Arena. Joe Rehmet from LUTV’s Lion Pride Sports speaks with Lindenwood men’s lacrosse head coach Jimmy Lauge about his coaching experience before coming to Lindenwood. This segment is part nine of a 10-part series of interviews with the head coaches of spring teams. 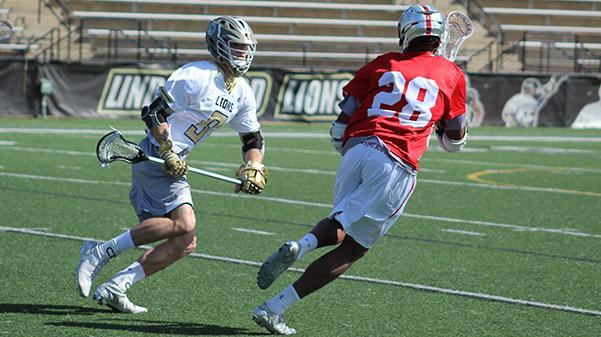 The Lindenwood men’s lacrosse season has not started yet, but coming out of a successful 2017 season, 2018 looks promising. Last year, the Lions finished 10-4 overall. Teams they defeated during the 2017 season include Shorter University, University of Tampa, Ohio Valley University, Alderson Broaddus University, Wheeling Jesuit University, Adams State University, North Greenville University, Rockhurst University, Lake Erie College and Maryville University. The team will have its first game of the season on Feb. 10 against Young Harris College. Young Harris finished with a 7-8 overall record last season. This will be a road game for the Lions as they play in Young Harris, Georgia, at 1 p.m. EST. The Lions will have their first home game on Feb. 23 against the University of Montevallo. The game starts at 5 p.m. in the Harlen C. Hunter Stadium.